Shaakirah’s family first made contact with IESA’s Information & Support service in May 2015. Early in April they were invited to share their story on ENCA news. Mom was feeling very nervous, so I promised to come around and sit with them before the interview. Shaakirah will be turning eleven this year and has never been accepted into the schooling system. Due to her parents’ perseverance she now attends the Carbanado Autism Centre, an NGO operating out of a local high school and so, at last, has the opportunity to be part of a stimulating programme and educated in a way suited to her needs. As I sat in the home of this family, their humility and hospitality were so tangible. It was an experience that I will always treasure. As each of their five children woke up one by one and came to greet me one could sense the respect, warmth and love this family had for each other. So many feelings and thoughts were shared during the interview, but as is the nature of the industry, the story was condensed into a few minutes. With that in mind, we wanted to give parents, Rifqah and Imran Haffejee the opportunity to share more with our readers and posed some questions to them. Tell us a bit about Shaakirah – the special things about her that others don’t get to see. Shaakirah is very loving and caring, especially when it comes to her little brother. She enjoys watching her sisters sing for her. She does get irritated with all of us when we don’t give her some space because we such a big family. She loves her music time she gets at school and she does it at home as well. She always makes sure all her siblings are together wherever we go. Shaakirah is very specific when it comes to going to certain places but her favourite trips would be to the beach, anywhere outdoors and she loves feeding the birds. What has the journey to try and find schooling for Shaakirah been like? It was a very long, stressful and strenuous journey for all of us. One moment you have hope and the next you cry your eyes out as you have been disappointed yet again. It takes time to come to terms with the news that your child has autism, especially when she did the same things as her twin. You basically go from one specialist to another and they refer you to certain places you must go to, you try anything and everything just to help your child. Our journey was tricky as well because we have five kids and we have to give the others attention too. With one person working, it made it more difficult as specialists and schools don’t come cheap. What has been most challenging to deal with in trying to secure her education? The most challenging has been the red tape to get children with special needs into schools. The process to get your child into a school is too demanding on the child and because they have special needs it’s even harder for them to pass the tests these schools have. These kids need time to adjust and gain your trust before you can get anything out of them and the specialists should know this. We feel the special needs schools that we have experienced (where Shaakirah has had the assessment) don’t have the patience and passion for these children. It seems as if they want the children to be “normal”. You get given false hope and only receive communication if you as a parent follow up. After many emails sent to the school, the reply was that our child will not get a second chance for an observation and that she was taken off the waiting list. I just feel that there was no care and it was very blunt. 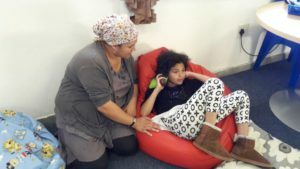 If it wasn’t for the support of organisations like Inclusive Education South Africa, Autism Western Cape, our Occupational Therapist, Fathima Ebrahim – and of course our saviour Sunkiree Verasaamy of Carbanado Autism Centre – we would still have been struggling. Shaakirah with Mom Rifqah at the Carbanado Centre. How has all of this impacted your family? This whole journey was so exhausting and draining and it really tested us as a family. As a husband and wife, we had to deal with a child who has become so frustrated being at home while her sisters are going to school. Through all of this, we were also just trying to lead an “almost normal” or “our normal” life. We would probably always have to work around what Shaakirah loves doing but we still challenge and push her and include her in everything her siblings do and vice versa, and in that way everyone is happy. At the end of the day, we love to nurture them in order to blossom. This journey is a never-ending journey but with the help of the almighty, we will succeed. Any words of wisdom you want to share with our readers? IESA recently coordinated the writing of an Alternate (Civil Society) Report on South Africa’s implementation of Article 24 of the UN Convention on the Rights of Children with Disabilities – also outlined in this newsletter. We wish to thank the Haffejee family for not only opening their home to us but their hearts as well. And we wish them continued success on their journey with Shaakirah.